I have mentioned, from time to time, how very few ships there are that come to Tristan, and how their visits are irregular. Never was this more the case than in the period since our arrival back from leave last September. Between mid-September and mid-March, a period of six months, we were visited by four yachts, all of which were making their way to Cape Town. We were also visited by the two deep-sea fishing ships that are operated by Ovenstones, the company with the concession for fishing in these waters. These two ships, the Edinburgh and the Geo Searcher, normally visit a total of just 9 times each year, and in the six-month period mentioned we had five visits from these fishing vessels. Apart from the four yachts and these fishing ships, in the whole of the six month period we had NO ships visit! All of a sudden, this dearth of ships turned into a glut, with visits from a yacht, three cruise ships and a research ship all in the space of six days! The yacht was a 45’ sloop called Jonathan. This is one of the more interesting yachts to have visited here. She was built to withstand the challenges of polar regions, with an extra-thick alloy hull and with generous insulation. She is owned and operated by a Canadian / Dutch team, and she carries out personal charters for up to five people. For some time she has been specialising in cruises in Patagonia and Antarctica, but now she is going to move on to new cruising waters. I suspect that the new waters will be announced once they arrive in Cape Town – if I were in their shoes I would definitely choose warmer waters! Jonathan dropped anchor here on March 15th, during a spell of particularly nasty weather. The following day, on March 16th we had the arrival of Le Lyriol. 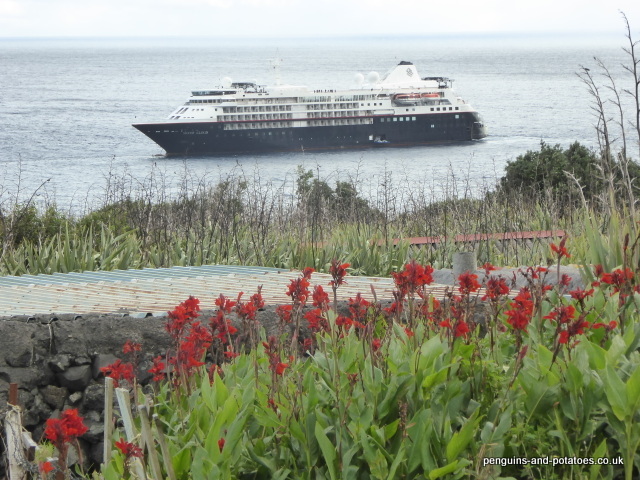 This small cruise ship is one of the nine ships in the French Companie de Ponant, which bizarrely is the only ocean cruise ship company based in France. This marked a repeat visit since she visited last year also. 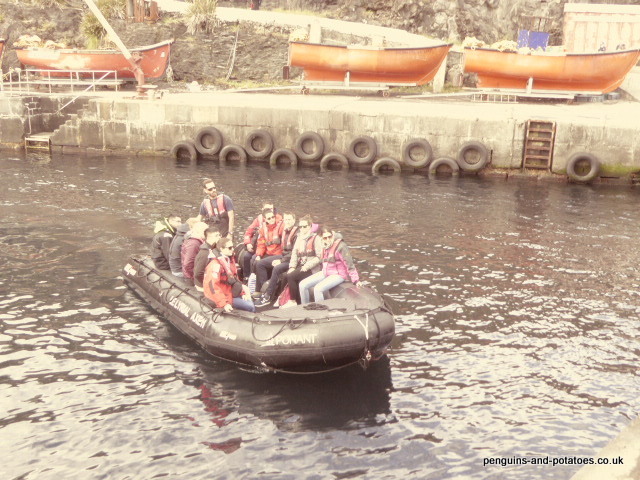 She carries 264 passengers and 139 crew, many of whom of course are engaged with the excursions. They were lucky because weather conditions were good, allowing the passengers to come ashore, to enjoy the unique ambience of the island, to buy handcrafts and souvenirs, and to frequent the pub that had been specially opened for them. Sharing the island with the passengers of Le Lyriol were the passengers of the Barque Europa, which also arrived on the 16th of March. Again the Europa was an old friend, having visited Tristan last year. The Europa is also a cruise ship, but a very different kettle of fish in that she is a barque rigged sailing ship, carrying only about 45 passengers. The passengers were of some 25 different nationalities. As you will see from the photograph, a barque rig is a 3-master, with the for’ard two masts rigged with square sails and the aft mast rigged fore-and-aft. All these ships had departed by the 19th, in time for the arrival of another cruise ship. The Silver Cloud is part of Silversea Cruises, based in Monaco and with its main administrative offices in London. You can get an idea of this vessel with a few simple figures – maximum 296 passengers, 222 crew, and 18 brand new zodiacs! The final ship to arrive in this busy week was the RRS Discovery, which arrived on March 21st. 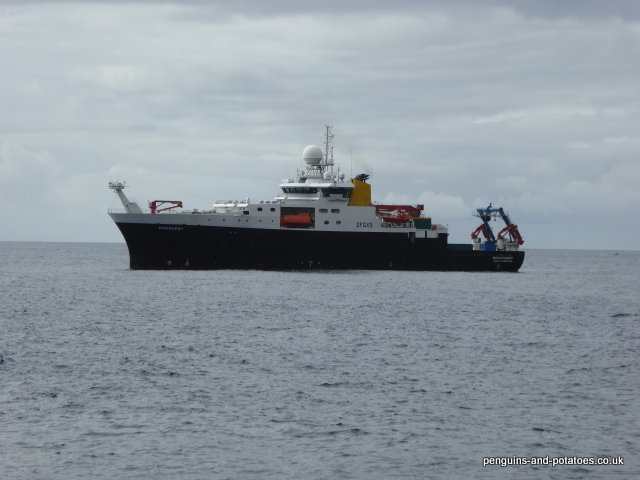 This Royal Research Ship represents the serious end of research into resources in the southern ocean, and I hope to dedicate a future article on research and strategic efforts on fishing in these waters. She was here on a joint expedition shared by the Blue Belt Programme and BAS (British Antarctic Surveys). 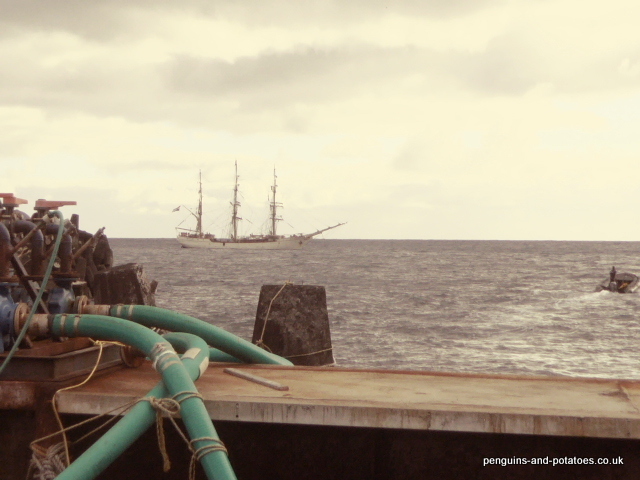 The Discovery arrived here after a program of work around the Falkland Islands, and she was to go on to spend time based on St Helena and the waters around that island. When she arrived here, she dropped off three specialists to work ashore, and then she went off to carry out ten days research work on the seamounts that lie within the 200-mile Tristan da Cunha Marine Protected Area, then she returned to Tristan to pick up the three specialists, to give a presentation on the fisheries-based observations and deductions so far, to pick up two island hitch-hikers who are off to spend six months on St Helens, and to take a large quantity of potatoes that are being sent from Tristan da Cunha to Saint Helena. There is a particularly interesting historical link between the present RRS Discovery that visited us in March, with the original RRS Discovery that was built in Dundee in 1901 which is now a museum ship in the City of Dundee. The original Discovery was in fact a Barque. One clever concept that the original Discovery carried was that the fore two masts, and their sails and rigging, were identical. This meant that the design carried exchangeability, and that spares of all sorts that had to be carried on board could be standardised across the two masts. The Discovery headed off in 1901 on the British National Antarctic Expedition, with Scott and Shackleton on board. Later, in 1925, the Discovery headed off on an Oceanographic Expedition to South Georgia. 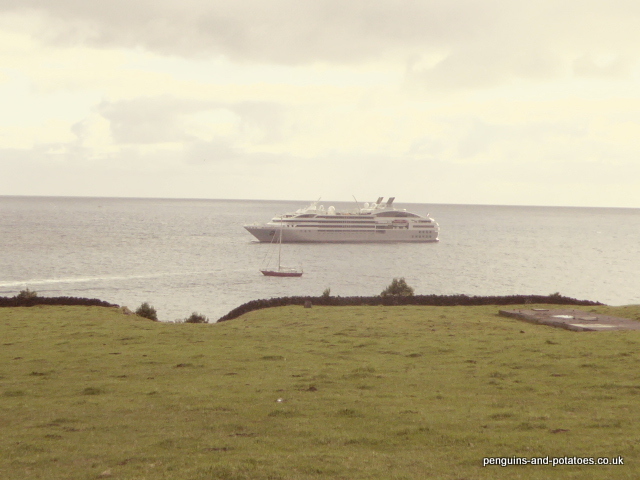 One of her duties on the way there was to deliver mail to the island of – Tristan da Cunha!